Bring your friends to Tio Leo’s from three to seven pm for $5 house margaritas, a flurry of appetizers, and a casual atmosphere to celebrate a hard day’s work. Monday through Friday from 3 to 7 pm get the House Margarita or the Sangarita (homemade margarita and red sangria) for $6.95. Enjoy their daily happy hour from 4:30 pm to 6:30 pm and get the super affordable house margarita for $5 or the Cuervo Shaker (Cuervo Gold and Marie Brizzard) for $8. Beachside has happy hour from 3:30 to 6:30 pm Monday through Friday. Pay them a visit to sip on a Cadillac Margarita (Don Julio Anejo tequila, lime juice, sweet & sour, float of Grand Marnier on the rocks). Your friend can have a Beachside Margarita (Peligroso Silver tequila, triple sec, fresh lime, splash of orange juice, sweet and sour served on the rock). Get $2 off craft cocktails all day Monday including agave-based margaritas like the Fleetwood (Serrano-Pineapple infused Blanco tequila, Dry Curacao, lime), the Royal (Herradura Reposado tequila, Cointreau, beet, blackberry, buckwheat honey) the Alistair (Don Julio Blanco tequila, cantaloupe, lemon, sesame), the Eli Cash (Pasilla infused Kimo Sabe, Verdita, Ancho Reyes Verde), or the Etheline (Montelobos tequila, grapefruit, sage). Get your margaritas at Le Papagayo everyday from 4 to 6 pm. Enjoy a nice house margarita for only $6. From 4 to 7 pm Monday through Friday, choose from a variety of flavored margaritas (17.25 oz) for only $4.95. Pick from peach, banana, lemon lime, strawberry, and raspberry flavored margaritas for your night out. From 4 to 6 pm Monday through Friday you can get $2 off a house margarita and their Pineapple N’ Chile Margarita served with a flame-roasted chili and martini style. Every weekday from 4 to 7 pm, Hennessey’s offers a big selection of happy hour drink specials for $5 including their Black Diamond Margarita. ALL NIGHT HAPPY HOUR ON MONDAYS! Two of the ten margaritas at Miguel’s are served in shakers, and you can’t go wrong with either. The Ultimate Margarita and the Pomegranate Shaker are quite popular with diners… almost as popular as their white jalapeño cheese dip. And for those that want to indulge without risking the bulge, Miguel’s serves up a “refined” margarita at only 135 calories. For something a little different, try the Prickly Pear Margarita, or spice things up with their Habanero-Lime Margarita. Come for Martini Mondays and get $2 off signature martinis like their Spicy Margarita ($11 originally) with Tequila Blanco, orange liqueur, lime, sweet and sour, muddled cucumber and jalapeño served in a salted rimmed martini glass). Dave & Buster’s steps up the happy hour game by having it twice, from 4 to 7 pm and then again from 10 pm to midnight. Get half off their extensive cocktail menu including tropical margaritas, low-calorie margaritas, fruit-flavored margaritas, all made with 100% agave tequila. From 3 to 6 pm Monday through Friday get a $6 Organic Agave Margarita (Casa Noble Crystal tequila and organic agave nectar shaken with fresh lime juice). Visit Twenty/20 Grill from 3 to 6 pm every day and get $2 off including the Spanish Margarita ($12; Azunia Blanco, fresh lime juice, Brandy-blackberry muddle, jalapeño infused agave nectar, Torres orange liqueur). Fresco has their Cadillac Margarita for $10 during happy hour. It’s a blend of Patron silver muddled with orange, lemon and lime slices, lime juice, agave nectar, and Grand Marnier on the side (originally $13.75). Dini’s boasts a great happy hour on Monday from 4 to 7 pm with a traditional margarita for $5.25 and a house-infused margarita for $6. Stop by for happy hour on Monday from 3 to 6 pm and then again from 10 to 11 pm for $5 house margaritas. Monday’s from 3 to 6:30 pm get the Ignite Margarita for $7 at Ignite Bistro. Come after work on Monday for 2 for 1 margaritas at Davina’s. Try the sinful Dangerous Margarita (tequila, agave nectar, Patron Citronge liqueur, lime juice, pineapple juice, fresh jalapeños). If you prefer a cocktail with heat, the Avocado Margarita (tequila, agave nectar, lime juice, avocado slices, chili powder) is a must-try. If you love latin music like Bachata, Banda, Reggeaton, or Cumbia, then head to Rookie’s from nine pm to close for $4 margaritas. RSVP to 7sixtyentrsvp@gmail.com to save yourself a spot. Every Monday, house margaritas (12 oz) are just $4 from 2:30 to seven pm. 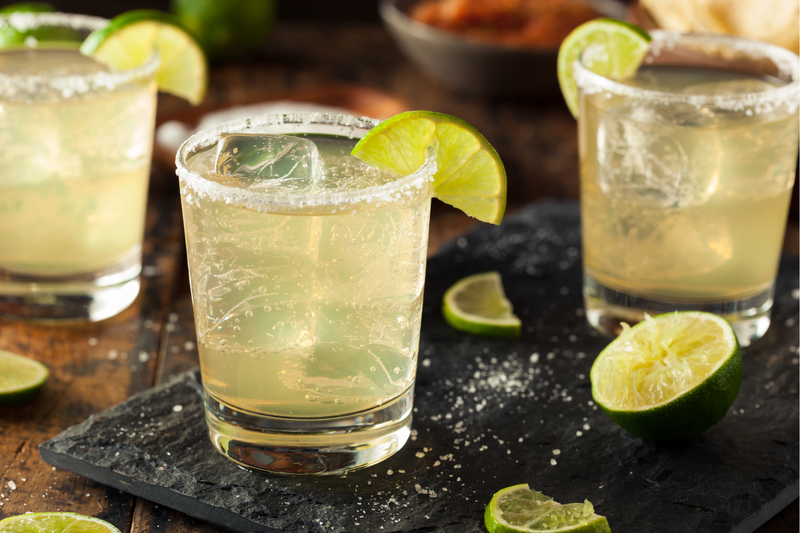 Give their top-notch tequila-based margarita a try. This house made margarita has a harmonious blend of sweetness and citrus. Come to Rockin’ Baja Lobster Monday through Friday from three to six pm for a Jameson Shot Margarita (frozen/rocks; lime, strawberry, mango, or red raspberry) for $5.50. On Monday you can order their drink of the day “Tradicional Paloma” (Cuervo Tradicional tequila, fresh fruit, Mexican Squirt) for $7.99. Hello Betty Fish House makes Mondays even better. From 3 to 5 pm get the Frozen Margarita (traditional, raspberry-cilantro-jalapeño, mango-guava) for $5. Master’s has happy hour all day on Monday. Stop by anytime on Monday and get a $6 margarita and relax. Happy Hour goes on all week (Monday through Friday; 2 pm – 6 pm). Head on over for Margarita Mondays to get $5 margaritas. Brigantine has happy hour from 4 to 6 pm daily. Get a Brig Margarita for only $9. Cocina del Charro offers the most affordable Margarita Mondays with $3 margaritas and $4 flavored margaritas from 3 to 5 pm every weekday. Applebee’s has really budget-friendly house margaritas on Mondays from 3 to 6 pm for only $3. From 3 to 7 pm head to Oggi’s for $3.50 margaritas. Are we missing your favorite spot to grab a margarita? Comment below!